Luke Schenn of the Philadelphia Flyers hits Tuomo Ruutu of the New Jersey Devils during the second period of their March 8 hockey game in Newark, New Jersey. It’s April, and the Stanley Cup lies in wait. The NHL postseason starts Wednesday, and with it comes the NHL’s most intense play. It’s not just the stakes that rise this time of year. It’s the on-ice aggression, too. Using data from every regular and postseason NHL game from 2005-06 through today, I identified every hit that was registered on the official play-by-play record. When comparing the total number of non-overtime hits in the more than 11,000 regular-season games and more than 750 postseason games, I found that there’s a massive and statistically significant increase in hits when the playoffs start. Regular-season games average about 42.0 total hits for both teams prior to overtime. In the playoffs, that number jumps 36 percent to 57.2 pre-overtime hits per game. The chart above shows these increases for the 18 teams that have qualified for the Stanley Cup Final over the past nine seasons. The 2009 Detroit Red Wings had the biggest change in intensity between the regular season and the playoffs — they averaged 14.0 more hits per game in the postseason. Last year’s finals featured the Los Angeles Kings, who increased their hit number by 8.0 per game, and the New York Rangers, whose hit number rose by 6.8. And it’s not just that the hits increase as the season goes on. When I restricted the data to only regular-season games in the last few weeks of the season (March and April), I still found a playoff increase of 14.4 hits per game. This suggests that the differences between the regular and postseason are not attributable to an overall increase in hitting as the season goes on. Thinning out the data a bit more to look only at regular-season games between two eventual playoff teams, I still found that there were 14.2 more hits in postseason games than in regular-season ones. The players, of course, have rising hit tallies themselves. The active player with the biggest increase in hits: Pittsburgh Penguins winger Blake Comeau. While Comeau averages just 2.0 hits per game in the regular season, his postseason average is 5.5. Even though he has played only six postseason games, this difference is statistically significant. 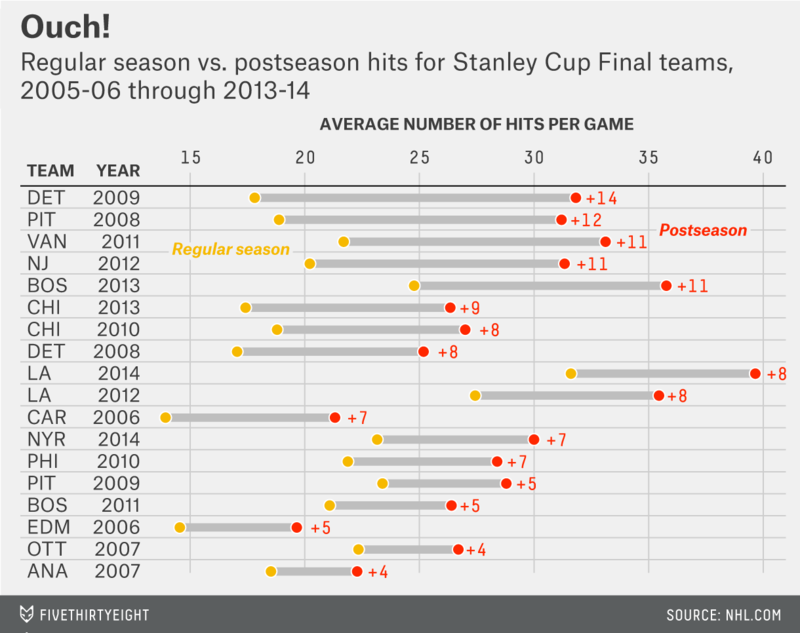 Every game in the the first round of the playoffs is likely to feature a lot of heavy hitting. If you’re looking for the series that should have the biggest intensity jump, look no further than the Montreal Canadiens versus the Ottawa Senators and Comeau’s Penguins versus the Rangers. Both of these series feature six players whose playoff increase in hits is in the top 50 in the NHL. Meaning the p-value was less than .05.